John Kagia Industry Analytics New Frontier Data – 2018 Cannabis Energy Report. Kagia is particularly interested in helping to identify and build sustainable competitive positions. His passion about issues such as disruptive innovation and new market opportunities, has brought him to focus on identifying strategic business opportunities in the fast-evolving marijuana industry. Kagia is Past President of the Mid-Atlantic chapter of the Market Research Association (MRA), and has earned Professional Researcher Certification (PRC) status. He is also an active member of the American Marketing Association (AMA). published prior to the deployment of medical and adult-use programs across 31 U.S. states and District of Columbia (D.C.). Though the cannabis industry at large is not a major consumer of energy relative to high-user industries such as the automotive, steel, or medical-care industries, its energy use is significant, and important to its consumers. Although this report focused primarily on electricity-based energy consumption, based on the analysis of the data in the data set, energy use in the cannabis industry requires further study, particularly given that energy consumption is expected to increase 162% from 2017 to 2022. Understanding consumption data becomes vital in planning for the industry’s future. While energy providers, regulators, and legislators are looking for credible data on cannabis cultivation energy consumption, many other key stakeholders need such data. Operators, investors, supply-chain and services providers are all leveraging data in the emerging space: As the industry continues to expand in both scale and reach, that intelligence represents a tremendous opportunity for further such research. By analyzing energy usage and costs, a business can assess its standing relative to others within cannabis and in other sectors. By establishing and tracking key indicators, including annual production, annual electricity consumption, canopy area, cultivation type and lighting used, a company can identify its cost drivers and develop ways to reduce them. cannabis markets, New Frontier Data is dedicated to publishing reports of the highest industry caliber. We hope that you enjoy all the benefits of this one as you shape your strategy and action plan within the cannabis industry! Before joining EDF, Rory was the Director of Energy Finance and Sustainability for the New York City Housing Authority. In this role, he managed the authorities $500M utility budget while promoting energy efficiency infrastructure projects and energy conservation initiatives among employees and residents. Prior to his role at NYCHA, Rory worked to develop the Public Sector Business unit of Constellation Energy, where he developed new business products and tailored internal operations to effectively pursue opportunities with federal, state, and local government agencies. Rory has a bachelor’s degree in Civil Engineering from CUNY Grove School of Engineering and an MBA from the CUNY Zicklin School of Business. The U.S. Department of Energy Solar Decathlon® is a collegiate competition, comprising 10 contests, that challenges student teams to design and build highly efficient and innovative buildings powered by renewable energy. DOE is excited to join two student building design competitions, Solar Decathlon and Race to Zero, into one new Solar Decathlon competition. Winning teams blend architectural and engineering excellence with innovation, market potential, building efficiency, and smart energy production. Simply put, there’s nothing else like it. If you are a student or a faculty member, attend this webinar to learn how to supercharge your classroom experience with the hands-on Solar Decathlon. Learn about various options for entering the competition and hear from Shannen Martin, a member of the 2018 winning team from Prairie View A&M University. Applications are due November 6, so register for the webinar, then get your team together and apply to compete! • Where are the current partnerships / collaborations? • Where are the current successes? • What future successes would we like to see? How do we get there? • What new or developing work would we like to see? How do we get there? • What policies need to be put in place for future success? Consider federal, state and institutional factors. • What are some opportunities for joint-funding / joint-research initiatives? • What has been effective in communicating success to stakeholders and the public? • Where are the communication gaps? The senior citizens agreed to get off the bus and cast their ballots later. Monday was the first day of in-person early voting in Georgia in the election for governor between Democrat Stacey Abrams and Republican Brian Kemp. Black Voters Matter is a nonpartisan group encouraging African-Americans to vote in the election, but the county government considered the event political because Jefferson County Democratic Party Chairwoman Diane Evans helped organize it, County Administrator Adam Brett said in a statement. ThinkProgress, a progressive news website, first reported the incident Monday. Evans said the event wasn’t political, nor did its organizers advocate for any candidates. Evans said she helped coordinate the event in her capacity as a private citizen, pastor and community leader, not as the chairwoman of the county’s Democratic Party. During the event, the senior citizens got excited about voting and they danced near the bus as “Say It Loud — I’m Black and Proud” by James Brown blasted through the speakers, Evans said. After the seniors got off the bus, they were initially told they could ride in a county van provided by the senior center to go vote, Brown said. But then the seniors had to get off the van because the senior center’s leaders decided it was close to lunchtime, and the seniors could vote another day. Jefferson County Commission Chairman Mitchell McGraw didn’t respond to an email seeking comment, and the senior citizens who were on the bus couldn’t immediately be located for comment Tuesday. The senior center’s staff routinely arranges public transit options for senior citizens to vote, Brett said. MARK NIESSE Mark Niesse covers elections, the Georgia General Assembly and state government. We are honored to announce Prince George’s County, Office of Central Services, Sustainable Energy Program received the Metropolitan Washington Council of Governments (COG) Climate and Energy Leadership Awards for outstanding efforts to reduce greenhouse gas emissions, increase energy efficiency, and advance regional goals established by leaders at COG. The awards were distributed Wednesday at the October COG Board of Directors Meeting by its Chairman, Loudoun County Supervisor Matt Letourneau, COG Climate, Energy, and Environment Policy Committee Chair and Prince George’s County Council Member Mary Lehman, and COG’s Air and Climate Public Advisory Committee (ACPAC) Chair Dr. Gretchen Goldman. Other pictured below are Nicolas Majett, Chief Administrative Officer of Prince George’s County, Dannielle Glaros, Prince George’s County Council Chair, Todd Turner, Prince George’s County Council Vice-Chair, Erica Bannerman, Energy Manager for Prince George’s County, and Jamee Alston, Management Analyst for Prince George’s County Public Schools. “This award exemplify our commitment to providing a clean energy, ecosystem-based approach to energy and climate change management for our residents and businesses” said Erica Bannerman, Energy Manager of the Sustainable Energy Program. “Its importance is further amplified by the award ceremony occurring the same week the UN’s Intergovernmental Panel on Climate Change report was released which called for immediate and large-scale action to limit global warming to 1.5°C”. OCS Sustainable Energy would like to thank our residents and businesses for taking actions to reduce energy consumption, cost, and carbon emissions. 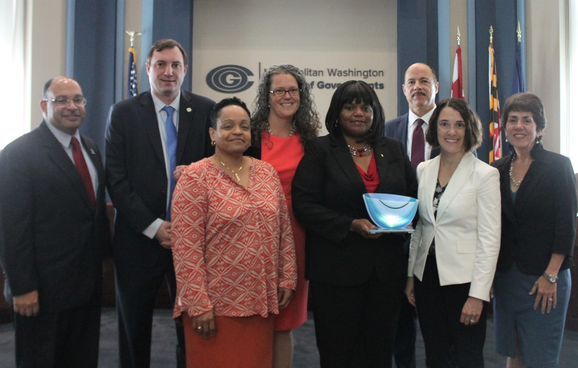 We would also like to thank our partners — Prince George’s County Public Schools, Exelon/PHI, The NEED Project, Prince George’s Community College, FSC First, and Employ Prince George’s — for helping us provide superior service to our community. Please see MWCOG’s press release and Ms. Bannerman’s video interview to learn more about the award. As a part of #EnergyActionMonth, we will participate in the events listed below. Please feel free to join us and learn more about the availability of energy efficiency incentives, solar incentives, how to winterizing your home, and much more. Join in on social media @myPGCEnergy online and use the hashtags #EnergyActionMonth and #myPGCEnergy when using social media! Visit Sustainable Energy Program website to learn more about the County’s clean energy efforts including the TNI Clean Energy Grant and Energy Star Certification & Green Leasing Grant. Homeowners qualify to receive grant funds up to $5,000 towards correcting home energy improvements and then can become eligible to receive up $10,000 to own their rooftop solar system! Commercial Buildings can get a piece of the pie too! Multifamily and Office Buildings can receive funds (up to $100,000!) to assist with ENERGY STAR certification. Funds for both grants can be used to offset the costs of electric energy-efficiency, water-efficiency, and retrofitting measures, and for the commercial grant for professional [engineering] services required to achieve ENERGY STAR Certification. Visit our website today to learn more about our energy efficiency efforts and initiatives! We have launched our social media sites, follow us to stay informed of County sustainable energy efforts (you can also click the icons at the bottom of this page). Dominion Energy on Wednesday issued a ‘Request for Information’, survey seeking comments from its nonresidential customers on their renewable energy goals as the utility develops its plan to add 3 GW of wind and solar by 2022. The survey asks Dominion’s commercial, industrial and government customers eight questions about their level of interest in renewables as well as the type and scope of projects the customers may be interested in investing in. The questions come a few weeks after Virginia released its 10-year energy plan, which aims to add 2 GW of offshore wind by 2028 along with 3 GW of onshore wind and solar by 2022. Dominion is the largest utility in the state and released its proposed 10-year plan in July. Both Dominion and Virginia’s 10-year energy plans are products of the state’s Grid Transformation and Security Act, which was signed in March by Democratic Gov. Ralph Northam and allows Virginia utilities to spend their excess earnings on grid modernization and renewable energy investments. The release of the survey indicates Dominion is looking to gauge its business customers’ interest in renewable energy development and “adapt renewable programs to meet customer needs” as it expands its clean energy development. “We welcome the opportunity to learn more about the renewable energy targets and goals of business and governmental customers across the state,” said Corynne Arnett, vice president of customer service, in a statement. Comments from Virginia business stakeholders regarding the state’s 10-year plan raised concerns about the “uncertainty” of planning for long-term renewable energy procurement as federal tax incentives wind down. The state also has a 1 MW cap for nonresidential solar customers, which solar advocacy groups said could dissuade larger commercial customers from participating in solar purchases. Dominion’s survey asks companies and government agencies whether they’ve set renewable energy or sustainability goals, what kind of resources they would support, “whether onsite or offsite”, as well as the size of project and length of time the customer would commit to hosting a project. A new study predicts that the price of beer could double because of agricultural shifts affecting one of beer’s main components, barley, caused by climate change, reported Nature. Due to an increased likelihood of extreme heat and droughts, barley yields worldwide could decrease by 3% to 17% by 2099, sending cost increases rippling down the supply chain, according to a study completed by climate-change economist Dabo Guan at the University of East Anglia in Norwich, U.K.
Worldwide beer consumption will likely drop considerably as well, according to the study, due to tightened supply and rising prices. Using simulated models of four different possible levels of carbon emissions, the researchers determined the likelihood of extreme weather in barley-producing regions ranges from 4% to 34% depending on greenhouse gas emissions. Tropical areas are likely to see the highest hit in terms of yield, with more temperate climates feeling the effects less. The next step for Guan was to determine the supply chain reaction to estimate price increases. A global average 100% increase in price between now and 2099 is the worst-case scenario, while a 15% increase in price is the best case. However, some individual countries may see much greater price hikes than these averages, since the study factored in how much demand will be able to withstand the price pressure. The study predicts Ireland, for example, will see the price of beer increase three times over what it is today. Unlike with fresh produce, the price of which often changes with seasonal availability and weather events, consumers are not used to fluctuations in the price of beer. Though it is an agricultural product, beer makers work to keep the price steady and absorb any pricing changes in their procurement pipelines apart from periodic increases due to inflation. This study suggests the supply chain may not be able to sustain this price stability for much longer. The researchers acknowledged that with the global food supply also threatened by climate change, beer may not be society’s greatest concern, but Guan emphasized that bringing to light the effects on everyday staples could make the wider implications of more volatile weather and rising temperatures more relatable. The Energy and Policy Institute (EPI) published data Tuesday showing six political organizations received nearly $8.4 million from the utility industry during 2017 and 2018, 70% of which went to Republican organizations. EPI’s data, first published earlier this summer, was updated to include 2018 Q3 filings from the Internal Revenue Service (IRS), as part of a decade-long record of the political spending of more than 70 utility holding companies and subsidiaries. 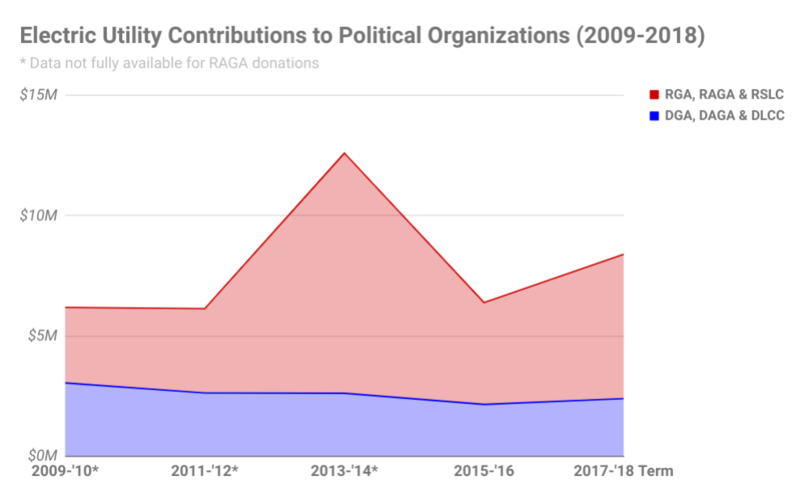 Since 2008, the industry has given three Republican and three Democratic organizations a total of $41.2 million, with the Republican Governors Association (RGA) receiving over $21 million. According to the political spending database OpenSecrets, the largest electric utility donor in 2017-2018 is Pinnacle West Capital, the owner of Arizona Public Service, with contributions over $2.3 million to candidates and political organizations. The company has spent nearly 10 times that amount to oppose a ballot measure in Arizona that would mandate a 50% renewable generation goal by 2030. EPI’s data shows utility contributions to Democratic organizations flatlined below $3 million in recent years while their Republican counterparts received more and more. This was not surprising to Sheila Krumholz, executive director of the Center for Responsive Politics and its online counterpart OpenSecrets. “With regard to electric utilities, this is an industry that is allied with the Republican party, they generally give more to Republicans,” Krumholz told Utility Dive. “Even in years when the Democrats were in the majority, they gave slightly more to Democrats, but when that flipped and Republicans took office” electric utilities contributed a much greater amount to political candidates, she said. EPI tracks the contributions made by the utility sector to the RGA, the Democratic Governors Association (DGA), the Republican Attorneys General Association (RAGA), Democratic Attorneys General Association (DAGA), Republican State Leadership Committee (RSLC) and Democratic Legislative Campaign Committee (DLCC). All six qualify as Section 527 political organizations according to the IRS, allowing them to accept unlimited donations. The EPI tracker showed that NextEra Energy, including NextEra Capital Holdings, spent the most money among the 2017-2018 contributors to the Republican organizations it’s tracking, accounting for $1,939,546 of $5,998,731. The company gave $290,450 to the three Democratic organizations by comparison. The top contributor to the Democratic organizations being tracked by EPI was PSEG Services, with $297,500. PSEG, whose service region includes several Democratic states, was one of six utilities to give more to the three Democratic organizations than to their Republican counterparts in the past two years. WASHINGTON, D.C. – Today, the U.S. Department of Energy (DOE) announced up to $46 million in research funding to advance holistic solutions that provide grid operators the situational awareness and mitigation strategies against cyber and physical threats. With more and more solar generation coming online every day, grid operators need the tools and technologies to ensure that the electric grid is resilient and energy services are delivered to critical infrastructure. These projects will develop and validate control strategies, real-time system monitoring, robust communications and other technologies to make solar power at the bulk power and distribution levels more resilient. Since 1978, we’ve focused on delivering transformative, sustainable, and appropriate solutions to today’s challenging environmental problems — using a personalized approach each and every time. Every day we are realizing our vision as a prosperous and productive environmental company that exceeds the expectations of our clients and employees, while delivering high-quality services that enhance the natural and built environments. 1. What or the negative economic impacts do you see on raising Alternative Compliance Fees on Pepco rate payers in DC B22-904, The Clean Energy DC Omnibus Amendment Act of 2018? 2. What issues would you like to provide some night on concerning DC Solar For All Program? 3. As the only African American grantee solicited by DOEE for fiscal year 17-18,what are your concerns and issues with DCSEU about the proposal point system. That provides and unfair advantage over DC non based solar development firms over DC based solar development firms? 4. What economic impact do you think attaching the PACE programs for DC residential home owners in DC as a amendment to bill B 22-904? 5. Would you support a amendment requiring a 35% set aside of all the revenues collected for Green Bank of DC have to be with a African American on Bank in Washington DC to finance minority contractors. Change — that’s the operative word in the electric utility sector today. The industry is undergoing a fundamental transition as it moves away from a centralized, baseload-focused past to a more distributed, renewable future. But how did we get here and where is this all going? Utility Dive takes an in-depth look at six key issues driving the utility sector today — from the growth of electric vehicles in the U.S. to the modernization of today’s power grid; the rise of state control over electricity markets to new and innovative ways for determining how customers pay for their electricity. We cover all that along with a look at the future of natural gas in the U.S. and how states are dealing with successors to net metering to continue promoting solar. Knowing where to mobilize restoration services ahead of a storm is the challenge rapid-response teams face. Discover how top companies are using this technology to restore power faster inthis free webinar. States want the benefits of electricity markets but also want to dictate their outcomes. How federal regulators strike a balance will influence the power mix for decades to come. Gas-fired generation has been called a bridge to a renewable future, but the length of the bridge depends on where it is. Replacements to the controversial solar incentive have cropped up in Hawaii, California and elsewhere, but policymakers have struggled to devise a replicable model across the U.S.
Utilities must prove to regulators that grid upgrades will help integrate a new class of resources reliably and cost-effectively. Time- and location-based price signals can guide customer usage, but electricity subscriptions could give more control. We welcome your feedback via the email and Twitter links below. As always, thank you for reading Utility Dive. The Utility Conference will give you the tools you need to be the hero for your utility and your customers. Our agenda includes both technology and program deep dives as well as cross-cutting sessions on regulatory innovation, utility business models, technology integration, and resilience. Early Access Sale Ends Oct 31! On Wednesday, the Michigan Department of Health and Human Services (MDHHS) announced that Wells was awarded the Roy R. Manty Distinguished Service Award from the Michigan Association for Local Public Health (MALPH) and the Michigan Public Health Association (MPHA). Dr. Wells consistently provides local public health departments and practioners[sic] timely (usually immediate), intelligent, expert, reliable, and compassionate support for the entire array of expected and unexpected community health issues that arise daily in our State. Her contribution to the health and well-being of the people of Michigan is huge and greatly appreciated by all those privileged to work with her, and should be acknowledged on behalf of every person who lives or works in Michigan. Wells took up the job of the chief medical executive for MDHHS in May 2015. That was just a year after state-appointed emergency managers made the catastrophic decision to switch the city of Flint’s water supply to cut costs. The swap from treated water sourced from Lake Huron and the Detroit River to improperly treated water from Flint River caused lead and other heavy metals from aging plumbing to pour into the city’s water, exposing residents to dangerous levels. Researchers also linked the water crisis to a flood of Legionnaires’ disease cases. The potentially life-threatening disease is caused by Legionella bacteria, which may have festered in the city’s pipes after the improper treatment interfered with disinfectants and released bacterial nutrients into the tap water. Officials tallied around 100 Legionnaires’ cases, leading to 12 deaths in the wake of the water switch. Wells’ charge of involuntary manslaughter is linked to one of those 12 deaths—that of John Snyder in 2015. Prosecutors allege that Wells knew about the Legionnaires’ outbreak as early as March of 2015 but failed to warn the public. They also allege that she later lied about when she learned of the outbreak, saying it wasn’t until late September or early October. The MDHHS did not issue a public advisory about the outbreak until January of 2016. Wells was unexpectedly slapped with the involuntary manslaughter charge in October of last year. The charge was added to others, including willful neglect of duty, misconduct in office, and lying to a peace officer. Wells allegedly threatened to withhold funding from the Flint Area Community Health and Environment Partnership if it continued to investigate the outbreak, prosecutors say. How is one honored for public health when they did not protect the health of the public? While I understand that we are innocent until proven guilty in this country, this is just disrespectful. 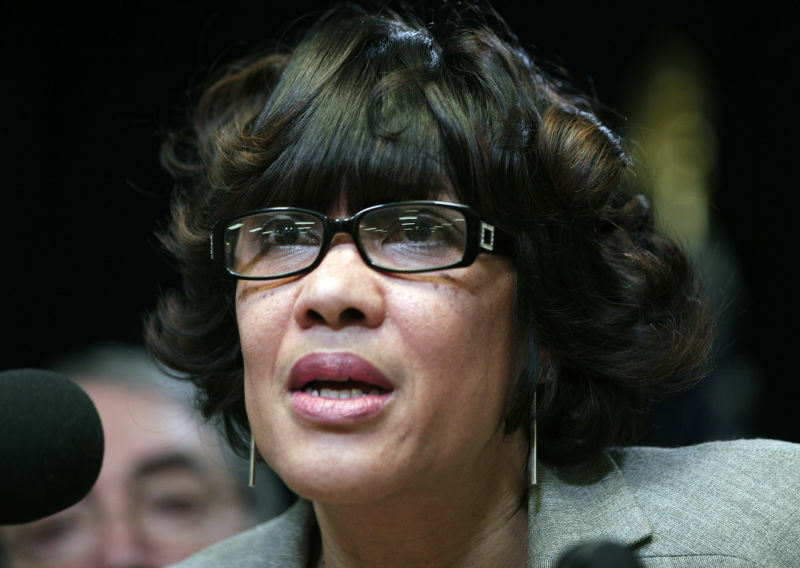 Wells’ legal team and supporters say Wells has been wrongly charged in the case and has championed the health of Flint residents in the wake of the water problems. An additional 14 current and former state and local officials were criminally charged in connection with the water crisis. Five of those officials also face involuntary manslaughter charges, includingdirector of Michigan’s Department of Health and Human Services, Nick Lyon. The Committee invites the public to testify or to submit written testimony, which will be made a part of the official record. Anyone wishing to testify should contact Ms. Aukima Benjamin, Staff Assistant to the Committee on Transportation and the Environment, at (202) 724-8062 or via e-mail at abenjamin@dccouncll.us. Persons representing organizations will have five minutes to present their testimony. Individuals will have three minutes to present their testimony. Witnesses should bring eight copies of their written testimony and should submit a copy of their testimony electronically to abenjamin@dccouncil.us. The deadline for applications is November 5th, at 4:30pm. The Request for Application and support documents can be found on the DOEE website, https://doee.dc.gov/node/1360726. Additional information and questions may be emailed to 2018GFAdevelopment.grants@dc.gov. An informational Conference Call and opportunity for Question and Answers will be held on 10/11/2018, at 11:00 a.m. The call-in number is: 1-877-784-3995; and Conference Code is: 3127831. DOEE seeks eligible entities to provide support for the launch of the DC Green Bank per the District of Columbia Green Finance Authority Establishment Act of 2017. The effort to establish the DC Green Bank, an independent instrumentality within District Government, is being led by the DOEE. DOEE is seeking applications from eligible entities for the best solutions to lay a foundation for the DC Green Bank. The amount available for the project is approximately $250,000.00. Email a request to 2018GFAdevelopment.grants@dc.gov with “Request copy of RFA 2018-1822-DIR” in the subject line. Pick up a copy in person from the Department’s reception desk, located at 1200 First Street NE, 5th Floor, Washington, DC 20002. Write DOEE at 1200 First Street NE, 5th Floor, Washington, DC 20002, “Attn: Jay Wilson RE:2018-1822-DIR” on the outside of the envelope. The deadline for application submissions is November 5, 2018, at 4:30 pm. electronic copy must be e-mailed to 2018GFAdevelopment.grants@dc.gov. For additional information regarding this RFA, write to: 2018GFAdevelopment.grants@dc.gov. The National Bankers Association, formed in 1927, has successfully met many challenges to enable it to enter into the new millennium as a vital trade organization for minority and women-owned financial institutions and has profited by collaboration on various mutually beneficial business ventures. These types of agreements will continue to aid the growth of the NBA as well as each participating institution. This year has been another successful one for the NBA. Smaller community-minded financial institutions must be cognizant that convenience and good financial products are important to all customers and, therefore, our aim to be more competitive drives every effort.